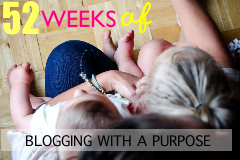 Today I am linking up with Becky again to talk about my goals for motherhood, which is by far the most important role I will ever have in my life. I have so many, so I will just list some of the ones I think are the most important to me. 1. To show my children what a strong, healthy, loving marriage is all about. I pray each and every day that Allan and I stay together forever, that we show our children what a healthy relationship looks like. I want them to know that arguements are ok as long as there is always love and they are handled appropriately. I want my daughter to know that a man should always treat a women with respect and value her. That men should open doors for women, do anything for their family, encourage her and stand by her through thick and thin. I want my son to know how to treat women, but also know that love should be reciprocated. I want him to find a strong woman, like his mommy, independent but so loving and one that will always put her family first. We plan to take both of our children on mommy/son and daddy/daughter date nights starting at young ages to instill these values along with showing them through our relationship. 2. I want to learn to live in the moment and hope they do the same. As a mommy and a working one at that, there is never enough time. I hear people say this over and over and it is one of my biggest pet peeves. We are all busy, we all have responsibilities and for me I want to try and remember that it is ok to slow down and just enjoy the little moments in life. 3. To be a role model for them. Not just as a mommy and wife, but also as a friend, sister and just in general. I want my daughter to know she can have career and family. I want them to treat others with respect. I want them to appreciate what they have and work hard. I want them to live healthy and fit lives. I want them to encourage each other and believe in themselves. I want them to have confidence and stand up for others and for what is right. These are things I know I have to show them for them to pick up. 4. To be a mommy and a friend. I do not want to be that mom who lets my kids do bad things, but I want them to know that if they do, they can come to me. They can call me if they screwed up and need help. I want to have open communication. For them to know what I expect of them, but for them to know that mom and dad are always here. 5. To never give up and to follow their dreams. I want them to believe in themselves. I want them to dream big and to follow their dreams always. They WILL have hard times, life will not always be easy, but as long as they face challenges head on, they will come out on top. Great Post! I love what you had to say about your marriage! Great goals. They are all mommy goals I share as well.